Although never considered a death sentence Type One Diabetes is a serious condition, the managing of which takes the sufferer to be disciplined and always aware of their health – something Gerard Hart has lived with his whole life. Controllable with twice daily injections of insulin and regular monitoring of blood sugar levels, the condition is manageable thanks in no small part to modern medical breakthroughs such as injector pens and tiny blood testing equipment. When diagnosed sixty years ago however, diabetes was a different matter entirely and few survived beyond the age of sixty due to the difficulties in controlling it. Which makes Gerard all the more remarkable. The Turf Lodge man was in the Mater Hospital last week to receive a medal for successfully living with the condition for sixty years. 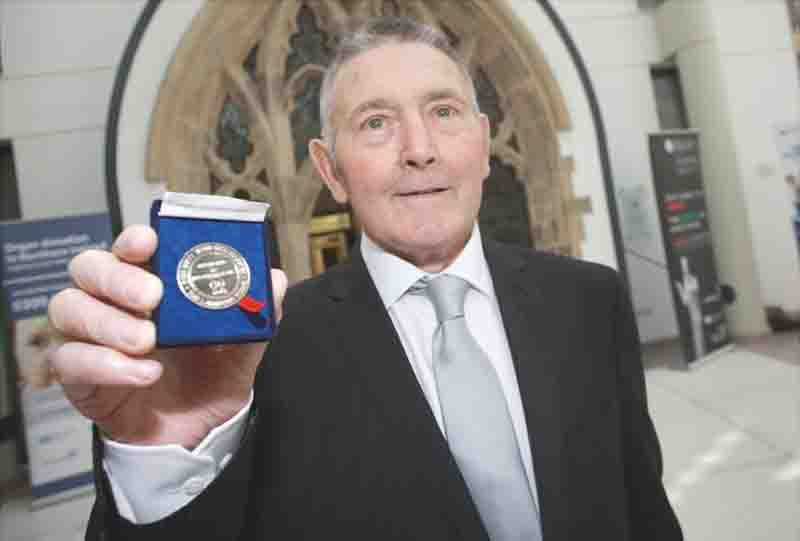 Surrounded by his family and consultants who have treated him over the years, 79-year-old Gerard was given the medal as testimony to how the condition is no barrier to a full life. Gerard says he remembers the day he was diagnosed clearly. “I didn’t know what was wrong with me but my mother got hold of a doctor’s book and looked it up and she thought that’s what it was. After diagnosis Gerard was put on insulin injections and has had two injections a day since then without fail. The injections when Gerard started bear no resemblance to the mini injector pens sufferers use now according to Ian Hopkinson from Diabetes UK, whose organisation created the medal. Ian said that only “five or six” of these medals are handed out a year because the insulin injections in the 1960’s and 1970’s were so traumatic. At that time many people with Type One Diabetes refused to take them and died earlier as a result. But despite going through a twice daily routine akin to stabbing yourself, Gerard and his wife Phyllis went on to have eleven children, nine of whom were in the room to see him presented with his medal. Originally from Clifton Street, Gerard has suffered non-related ill-health in recent years suffering two strokes and undergoing heart bypass surgery last year. But along with his wife, the commitment they have shown to managing his illness meant that his diabetes has not been the cause of any health crises, something Consultant Mark Gormley says is remarkable. “I presented Gerard with his 50 years medal ten years ago and I’m delighted to be able to give him one for 60 years. Dr Gormley, who has treated Gerard since 1985, said he was an example of how the condition could be successfully managed. Dr Gormley presented Phyllis with a bouquet of flowers for her role in helping Gerard administer the insulin. She said she had her own methods of keeping him in check. “I kept a big stick behind the door,” she laughed. Gerard’s daughter Mary Hart Harris said all the children were immensely proud of him. “We are all very proud. My brother John helps look after him and knows his condition very well. Two of the children are in Canada but nine of us made it along and it’s great to be here”.